VoIP/SIP client tailor made for BlackBerry. Connects your IP telephony with your BlackBerry smartphone. 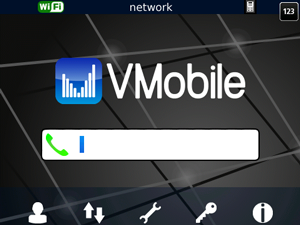 VMobile Softphone delivers your land line VoIP / SIP calls to the BlackBerry device in your pocket. Works both with Wi-Fi and 3G. A BlackBerry app transforming your smartphone in a moneysaving tool. You can be abroad and get high quality Wi-Fi calls for much less money than roaming service will charge you. Now VMobile Softphone gives you access to multiple (2) accounts. Supports multiple SIP / VoIP accounts. Ability to switch between two SIP profiles. 1. 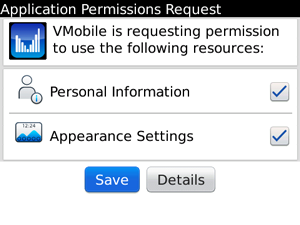 At initial installation VMobile Softphone app requires access to the smartphone recourses. 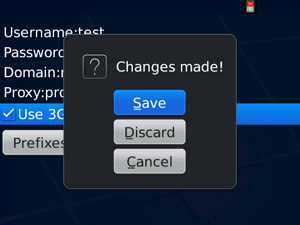 Please confirm with Save button. 2. Connect the device to any Wi-Fi hotspot. 3. Start the VMobile Softphone app and go to Settings menu. Please check carefully your account credentials as user name and passwords. Ask your SIP vendor for its proxy and domain name. How can I check my com port? During the initial registration fill the Proxy field with your SIP server as: sip.mysipvendor.com:5060. The last four digits stand for com port which with VMobile Softphone should be 5060, as it is most common used one. If at any time and for any reason, you do not feel that your purchase has lived up to your expectations simply request a refund. VMobile purchases are accepted for refund within 7 days of the original license purchase. Please indicate your reason for returning the license you have purchased in your refund request sent trough e-mail to our support e-mail. The request must include the license key you have got after paying for the application. VMobile is a new telecommunication company working on mobile and fixed lines solutions. 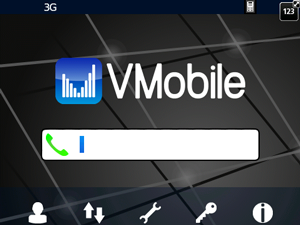 Working since 2011, VMobile is established to give its customers accessible phone calls via their smartphones. VMobile is a project strongly relying on innovations in telecommunication sector as well as our engineers’ and developers experience. Our team is perfectly familiar with the delivery of quality telecommunication services. As experts, we are aware of the fact that this process can be optimized much more. This means less costs for our customers, combined with the same or even better quality of what you get until now. The free access to data and information is key value of the society we`re living in. If this access is granted to all of us, this means we`ll be able to be more flexible than before, more effective and respectively – more successful. With free data access we`ll be able to cut our telecommunication costs. Transforming voice in to data combined with the ability of public Wi-Fi networks for free data transfer, we`ll get cost reducing calls. No matter what country we are in, we couldn’t have to pay roaming charges. At VMobile we are working to deliver our customers the ability of free and accessible calls. And to pay much smaller bills. More than 5 Stars!!!!!! 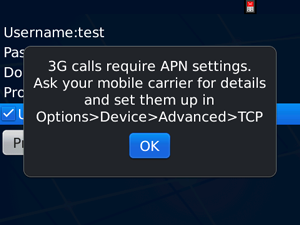 I test many VOIP Apps for my BB 9900 but nothing work like this one. Very easy to setup and very easy to handle. Now with the BBOS builds 7.1.0.8xx its also no problem anymore with the sound problem which was there before on BBOS builds 7.1.0.7xx.. If you search a VOIP app buy this one and you be happy. I compared the eSky VoIP app with this one, and I can clearly say that the VMobile had the bugfree installation and a good voice quality during the calls over WiFi and 3G. However, a core feature is missing: eSky allows to choose between VoIP and normal GSM call during each call seamlessly, but VMobile only allows calls once you have started the app. If they add this additional feature to Vmobile, it would be unbeatable in the BB VoIP scene. This is a great SIP client! Just wanted to let your team know. Thank you!! Perfect ! Excellent ! Software works very well; technical support is fantastic ! Thanks a lot !!! I'm absolutely in love with your blackberry app and thank you again for all the help. I must say I really like the Vmobile app. I tried many others and those are just crap. Vmobile is simple and small application, which just works. Thats how I like it. It worked just grate!! I tested with another Argentine user and we could talk perfectly. 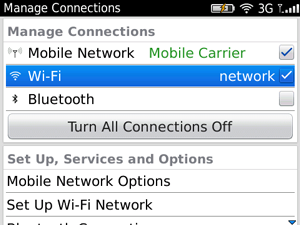 This is the best and cheapest SIP client for BB. I tried all others, they all have poor audio quality. The new version is much much better, thank you very much, that's exactly what I needed. Very small, very easy to use. Works perfect for my asterisk server. Merci ca marche! Merci pour votre rapidite et efficacite. thanks for your help. I just bought the app because of your extremely good support in answering my emails. Just want to say thanks for all your help. I also add Very Positive review in the AppWorld for the software.